Please disregard the previous negative review I wrote which said that the bedspread was the wrong size. I have discovered that I had not completely unfolded it. It is actually the right size, after all, and I like it very much. I had said that the fringe was only on 2 sides, but that is wrong - the fringe is on all 3 sides, as it should be. I apologize for the misinformation I gave earlier. The bedspread does not cover the entire bed. It does not reach the floor, and it does not reach he top of the bed. The bedspread goes from the foot of the bed to 3/4 of the way up. It is only 62 inches long. There is fringe on only TWO sides, which is along the bottom and along just one side. This is absolutely UNBELIEVABLE! The pattern and colors are beautiful, so it is disappointing to have to return it. Another thing -- if I have a King Size bed, then it is likely that I have King Size pillows -- but the shams are only standard size. Thought it would look good on my bed and go with room colors. It is very pretty and looks like it will make my bed look comfortable. Why is there fringe on just two sides of the bedspread, along the bottom and along just one side? BEST ANSWER: Thank you for your question. The fringe goes along three of the four sides. We hope this information will be of help to you. When I put the bedspread on the bed, the bedspread was only halfway unfolded, so the fringe appeared to be just on two sides, and the bedspread was not very long. I thought it was defective. However, after a while, I finally was able to open it up completely, and now it is as it is supposed to be, and I like it very much. For some reason, when I took it out of the package, it was folded so tightly and securely that I was, at first, unable to get it to open up. 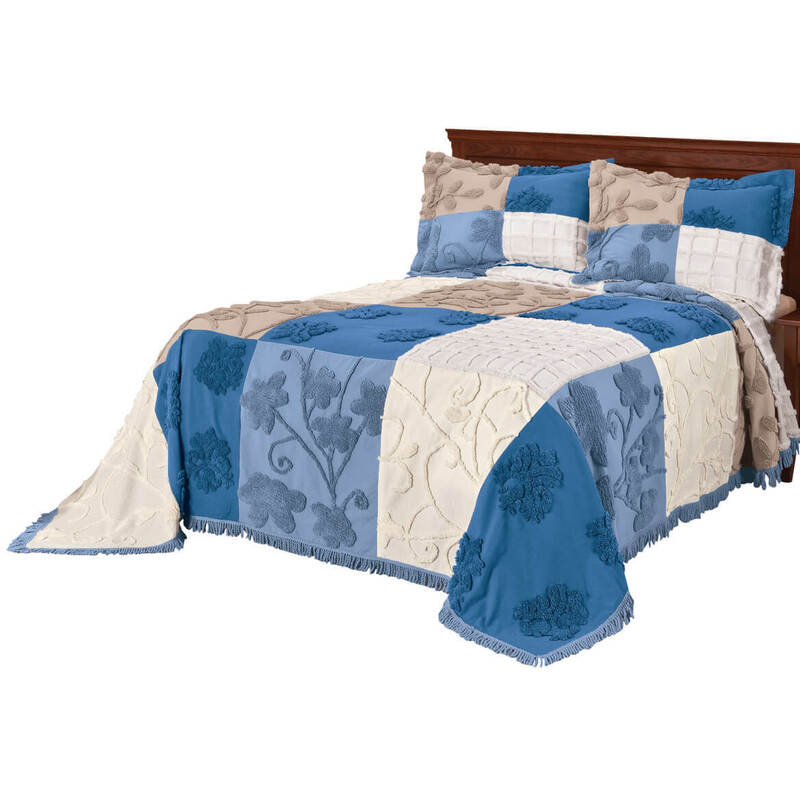 I just love this bedspread, it's so pretty. Thank you for your reply to me.